I recently stayed at the delightful Cabana Bay Beach Resort and while I was there I had the opportunity to get some good video and photos of the construction progress over at Volcano Bay. Volcano Bay will be Universal’s water theme park that will be opening sometime in 2017. 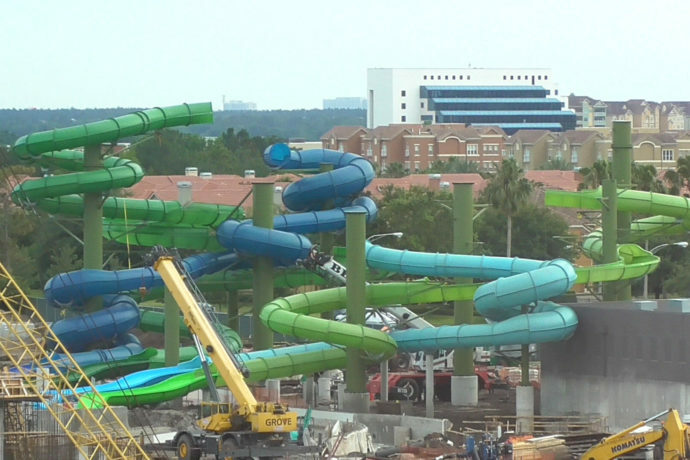 (In preparation for its opening, Wet ‘n Wild will be closing later this year.) The new water park will be located directly south of Cabana Bay and will be visible from the pool area at the resort, as well as from I-4. The giant centerpiece of this new water park will be a massive volcano. The volcano will have multiple slides and rides built-in to it and a wave pool beside it. In addition to the steel structure for the volcano you can also see some of the slides being installed near the south side of the site. Check out the video as well as lots of images of construction below and stay tuned for more theme park updates! Volcano Bay as seen from Cabana Bay Resort. Notice the curving berm separating the two properties. That’s all for this update! Be sure to watch and share the video!